Can I ask one favor? Could you measure the dimensions of the case for me? Height, Width and Depth. I don't trust what the spec sheet says lol. Thanks, it looks a lot different now. Still got the 6600k and 480 but now they're both in a custom loop :) Never got round to uploading it though I probably will when I upgrade the CPU and mobo! So sorry, I won't be able to answer your question. Forum Topic "IOBit Driver Booster (or any other driver update programs)"
I use driver booster for installing all drivers (except GPU) never had a problem (yet!). I've only ever used the free version but I would say it's a good program. Forum Topic "C drive stuck at 100% all the time"
Have a look in resource monitor on the disk tab. Sort the disk activity window (bottom half) and see if anything has a really high Read, Write, Total or response time. From there we can figure out what is causing the issue and fix it. Forum Topic "What is this cable?" Yeah bengy's right. That's a half USB port connector. Plug it into a USB header on your motherboard, one row will be left unconnected. Forum Topic "ASRock AB350M - Can't OC CPU/Less usable RAM than installed"
Try using Asrock A-tuning or Ryzen master and see if either of those will let you OC. The memory thing is normal. A small amount of space is reserved for various reasons and so isn't usable to Windows. Normally I'd expect to see 7.8 or 7.9Gb available but it may be that your configuration needs more reserved for dual channel. In regards to overclocking AMDs site says it's unlocked. Screenshots would be needed to help much further (unless someone familiar with the bios is around). Forum Topic "Need Help! Will DDR4 3000MHZ work with GA-H110M ? Will it Work?" Forum Topic "AMD's first CPU vs their newest"
I don't think a 4 bit shift register cuts it as a microprocessor. The 9080 was their first actual microprocessor which is what the OP was asking. Forum Topic "ASrock X399 Taichi Not reading All G.SKILL TridentZ RGB Memory in Win 10"
There's nothing wrong with it. There's always a small amount of ram that is hardware reserved meaning it's not usable to Windows. My PC shows 7.9Gb instead of 8Gb for example, it's completely normal no need to worry. Forum Topic "Dual Monitor Question"
Yeah, I'd use the outputs from the GPU for sure. Forum Topic "Selling Asus Maximus VIII Gene z170 1151 mATX motherboard"
Forum Topic "Better wattage recommendation"
Update: he got a CX500M cheap from a friend and all is good now. Forum Topic "Need guidance on OC'ing Asrock Z270 Taichi"
Just read everything in the post before you make an attempt if this is your first time and you don't understand what most things mean. If the voltage is dropping a lot at idle when the CPU downclocks itself and you don't want it to. You'd need to set fixed voltage and turn off C-states (to fix the CPU at the max frequency.). If the voltages fluctuates a little depending on load then you need to tinker with LLC. Despite the system working fine without the GPU installed? Edit: I know what you mean and there could be some crazy thing going on but we've agreed it's worth getting a better PSU and keeping that one especially considering he's planning on upgrading and you never know what you'll end up with. I had a 780ti for a bit, I wouldn't have been able to power it if I had cheaped out. He brought it round and it works just fine. OCs very well too. Good to hear they have something planned. It works just fine without the GPU and yeah I agree he didn't look anything up. He doesn't have a lot of money and wanted to get something running with the intention of upgrading later. As you can tell that's backfired. It works just fine without the gpu installed. A 350W is a bad idea with an Rx 580 regardless. It's ok, it's my PC. Not yours, personally I quite like it. It's actually changed up a bit since my last update, I'm now in a even worse airflow case but I'm planning on watercooling my gpu to fix that. Also, I've got an Rx 580 now thanks to a Vbios change. It's now in a blue case with a nice blue LED fan in the back. I up sized a bit to micro-atx to potentially accommodate an upgrade to AM4 similar to you. (I had a look at your part lists :P ) Would probably get an Asrock Taichi cause I'd want to see how good an OC I can get. I do currently but here's a little story. Bought a 128Gb SSD near christmas for another PC but only got round to installing it and transferring everything the other weekend. The first time I cloned the disk it didn't work but it did the second time. I wiped the original HDD after I checked everything seemed OK and moved the documents etc off. I powered the system off for the night and came back the next day to finish up. Logged on etc fine and left it for a few mins as I was doing work on my own PC at the time. I went to open chrome and windows was frozen, the mouse worked but not the keyboard. After a minute it BSODed with CRITIcAL PROCESS DIED. Upon restarting I was informed there was no bootable drive. After about 2 total disk writes and a day of usage the SSD had died. I hadn't even finished moving stuff off it before it died. The replacement is on its way right now. So yes, backup your files and keep all important files on a HDD. You never know when your SSD may spontaneously die like that one did. Forum Topic "stock cpu cooler/fan too loud"
Either of those are good picks. Forum Topic "Disk 100% Help Please!" Ok, can you open resource monitor, click on the disk tab and look at the second section in the middle (disk activity). Sort by Total (B/sec) and Response time and tell me which process is staying at or near the top. This way we can see what is using up all the disk time. I had a weird thing where WPR (windows performance reporting) was using 100% of disk time for no reason. As soon as I used that command it stopped. After a few days the problem went away. Forum Topic "Have any of you won anything?" Though last night I had a dream that I won something so funny of you to post this. Forum Topic "RX 480 does not properly fit into case and PCIe slot"
The PC still works fine but I need to fix this ASAP. No real problem then. If the sticking out tab over the display ports is flush with the case where you screw it in then you're fine. Forum Topic "Sapphire Radeon RX 480 8GB NITRO+ Video Card vs. MSI GeForce GTX 1060 6GB 6GB GAMING X Video Card"
"the 480 is the faster card nowadays and with the extra 2gb VRAM"
VRAM and memory capcacity doesn't matter until you don't have enough at which point it's a really big problem. Whilst I don't know much VRAM various games use I agree with your general idea as 6gb seems to do for now. But, as you said maybe not in the future. I have the 480 but both cards are very good 1080p/ light 1440p cards. Neither is more suited for gaming, however, the 480 is the faster card nowadays and with the extra 2gb VRAM. Just be warned the Rx 580 and 570 are coming out real soon offering better clocks and about the same price. Forum Topic "Static from front headphone jack"
I use to have really bad interference too. I changed cases and it went away. Since then (and still do) I plug everything into the rear audio jacks. You may be able to reduce it by routing the cable differently. Avoid your PSU mainly. Forum Topic "What does "uce" mean?" 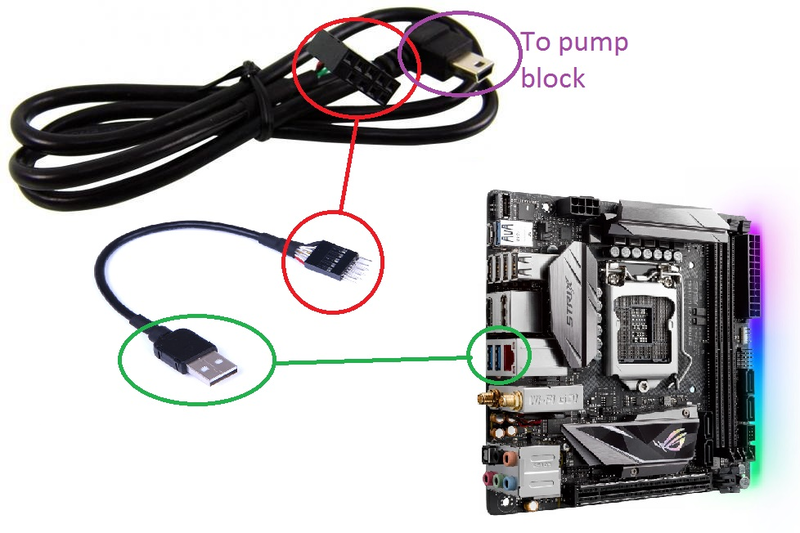 Forum Topic "Help Asus Strix z270i has no USB"
I think you misunderstood so I made a picture to better describe my idea. I found the extra cable by searching "USB internal adapter"
Would something like that work? Plug one end into a USB port on the back and run the cable into the case then connect your AIO. Forum Topic "Is it me or is this AWESOME?" You know what would be better? There's enough of it about now and I think it looks pretty cool. DDR4 really doesn't need active airflow, it's so low power. Forum Topic "I5-6600k best OC speeds seen"
Been running mine at 4.5 with a 150mV offset since I got it. On my really bad Asrock board. Reported voltage whilst loaded is 1.2 to 1.25V. Have run it briefly at 4.8GHz set at 1.4V but my board isn't good enough as I get some much lower voltage under load. Forum Topic "BEST GTX 1060 VARIANT?" Gonna go out on a limb and say it's not worth buying the 'best' 1060. Just selected "Gtx 1060 6Gb" from the left and sorted by clock speed. Forum Topic "triple 140mm intake fans"
The Be Quiet! Dark base (pro) 900 can do everything you said. 3x140mm fans in the front and reversible mobo tray. Also got options for a tempered glass window. Forum Topic "The best CPU cooler(Air/Water) for A i7 7700K to reach atleast 5.0ghz"
Honestly a 240/280 aio and deliding the CPU replacing the paste with liquid metal is the best bet. The stock paste is pretty horrendous this time round. Deliding isn't hard or very risky with the special deliding tool. Forum Topic "Parts are not compatible"
They're standardised so there shouldn't be any problems. The clip on the psu connector goes over the bump on the motherboards connector. Forum Topic "SSD size needed for windows 10"
I feel 120gb ssd's are the minimum size you should buy which can have windows and a few games and programs. 240+Gb drives are normally quite a bit better gb/$ and can store quite a few games and stuff. Forum Topic "AMD Ryzen price hype is doomed to fail? A realistic price expectation analysis"
I agree with the prices you have proposed there. Also bear in mind the Mobos will most likely be cheap compared to Intels due to PGA socket etc. Less than 10% if there's a drop at all. Specifically on the X99 platform. Forum Topic "ASRock AM4 line up"
You know the lower end boards aren't meant for OCing? If they can get away with using a less powerful VRM on the cheap boards that's why they're doing it. To make them cheaper. The proper X370 boards meant for OCing look very good. Phase counts look good to me? Even the MSI titanium had only 10 so 9 is very good.